Chicken and waffles never looked so good. When it comes to equipping disciples with the tools needed to dominate their fields, some institutions are simply a cut above. For example Cal Tech for would-be engineers and ITT Tech for would-be accreditation. Now out of Oakland comes a soul food spot equipped to dominate your mouth. Say hello to Gussie's Chicken and Waffles. From a chick who cut her soul food chops at Oaktown's chicken and waffle mecca at Roscoe's, Gussie's is the new go-to for that ubiquitous combo and more. It has plenty of room for 100 plus folks to sit in a warmly lit dining room with a flat-screened bar, and sun-drenched front patio perfect for getting fat on the sidewalk dining al fresco. 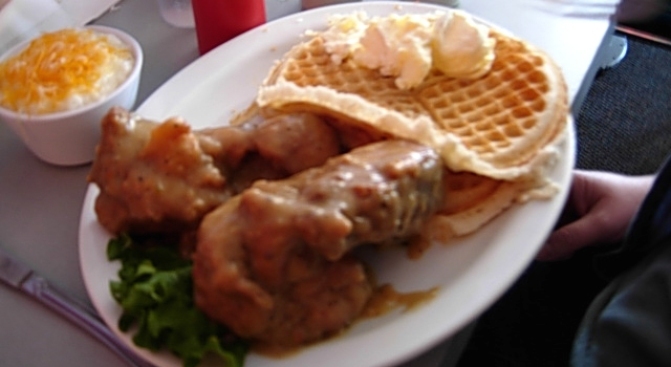 First things first: Gussie's slings several types of homemade waffles -- buckwheat, banana pecan, sweet potato, and buttermilk -- the latter two of which are served with up to half a succulent n' crispy fried chicken and smothered in gravy and onions (optional). While the former go better with fresh fruit and maple syrup, according to the menu and your cardiologist. Fried bird also comes flanked by any number of savory sides, including black-eyed peas, candied yams, collard greens, grits. While big ol' specialty sandos include Louisiana fried catfish or red snapper on a fresh roll with veggies and house-made tartar, which ten out of ten dentists are reluctant to admit they're totally down with! Rounding out the menu's a bevy of choice dessert options, ranging from banana pudding with Nilla wafers, to a chocolate/Kahlua/coffee bundt cake, to a cream cheese frosted red velvet cake, equipping you with the tools to dominate yet another institution: Rochester Big and Tall. Gussie's opens Monday at 1521 Eddy St. in San Francsico.